Huawei looking at 6-inch Windows Phone? Imagine this with Windows Phone. MADNESS! Huawei has let slip that it wants to bring out a Windows Phone 'similar to the Ascend Mate'. That would mean a larger-screened device with an HD display and more power under the hood, and at least 1GB of RAM to harness the power of all those pixels. The news comes from CNET Asia, which was told byHuawei product manager Richard Bhudhikanok that the firm was looking to bring something like the Mate to the market in a Microsoft flavour. He wasn't forthcoming on when this would be happening, or indeed if such a device would ever be seen outside of Asia. It would be surprising to see such a leap in screen size for Windows Phone – the largest so far has yet to break the 5-inch barrier, and we've only just seen support for HD screens appear with Windows Phone 8. In the same way as Samsung with the Ativ S, which has been compared to the Samsung Galaxy S3, it would surely serve to promote the spec shortcomings of Windows handsets. While you can argue there's no need for a quad-core chipset thanks to the improved efficiency and power management of WP8, in the eyes of consumers it would still seem like a step down. However, if Windows Phone is ever to get the same kind of traction as Android it needs a flood of handsets to attract consumers, so perhaps Huawei taking a punt on a huge phone would show that the OS is worth taking seriously. What do you think? Does Windows Phone (or any OS, for that matter) need a phone with such huge dimensions? 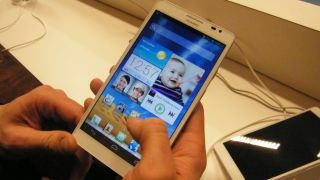 Or should Huawei try to make a standout phone that will actually fit in your pocket?